This walk starts in the pretty village of Beer in Devon, with the White Cliffs, unusual for Devon. 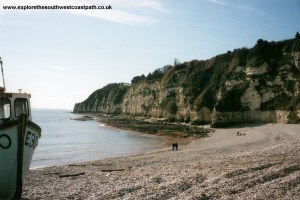 The walk then passes through the resort of Seaton before entering the Dowlands Landslip. This area is now a wood, but was the sight of a massive landslip. This part of the path is remote, with very limited views out to sea and can be frustrating since it is difficult to gauge where you are or how far you have to go. 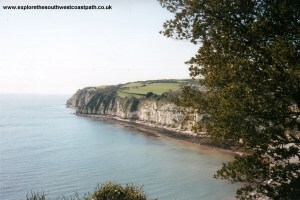 The path comes out of the landslip and crosses the Devon and Dorset border into the popular resort of Lyme Regis. Beer is on the B3174, which is just off the main A3052 between Exeter and Lyme Regis. Parking is a little limited in Beer though so you might have problems parking in the busy summer months. Public transport to Beer is a little limited. Bus service 899 runs between Lyme Regis, Seaton, Beer and Sidmouth but it is infrequent. Bus service X53 runs between Exeter and Lyme Regis and stops in Beer, but is also an infrequent service. If these services are not frequent enough, service 885 runs hourly between Seaton and Axminster. There is fairly limited range of accommodation in Beer and Seaton, but a good choice in Lyme Regis. There is a tourist information centre in Lyme Regis which has a full list of accommodation in the area. Beer is a small but pretty village, with the beach being particularly attractive. The white cliffs of the coast here are unusual for South Devon. The coast path is well signed out of the village and into Seaton. 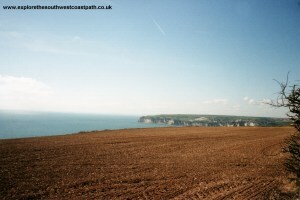 The path initially climbs from the grassy area beside the road to the beach and then follows the cliff top round to the western end of Seaton bay. Fromm here there is a low level walk along the beach into Seaton. 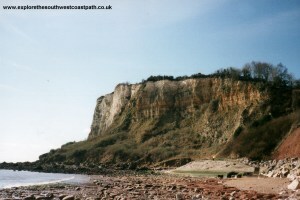 The cliffs here are interesting, going quickly from white chalk back to the red cliffs which are common in South Devon. There can be a bit of a scramble over rocks on the way into Seaton. 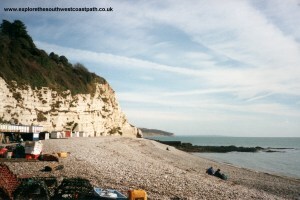 There is a shingle beach at Seaton and there are plenty of places to get refreshment here. The coast path continues along the promenade to the end of the beach, where you must stick to the road and the bridge over the river Axe at Axmouth. You initially follow the road bridge but can then bear right onto the old road bridge, closed to traffic in 1990 and replaced with the new bridge on the left. Once past this bridge, take the small lane to the right signed to the golf course. You climb to the car park of the golf course and then keep straight ahead passing the club house on the right and then follow keep straight on, along the right edge of the fairway. Keep going straight on until you rejoin the track, which becomes a path a bit further up. This path then cuts across some fields to go back towards the coast. There are spectacular views back towards Beer from the cliff top here. After a little distance you will reach the beginning of the Dowlands Landslip. 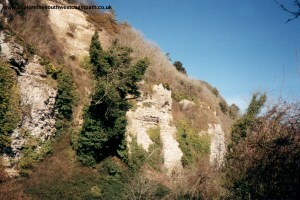 There was a massive landslip in 1839 which forms the coast path most of the way into Lyme Regis. 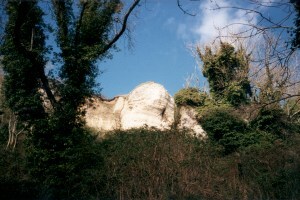 This area is also commonly known as the Undercliff and is now a nature reserve. There is no access to anywhere else from this section of the path, which is around six miles in length. Views to the coast are also very limited. The path is not signed but is fairly easy to follow, though it is quite twisty in places, and you may find you have to climb over some fallen trees or branches on the way. It is also changed from time to time, due to land slips or fallen trees. Some people find this section of the walk frustrating, others find it very enjoyable. Due to the poor signage and the rough terrain (which can get very muddy), you should allow plenty of time to walk this section. It is unfortunately difficult to gauge progress through this section too, because there are so few landmarks. 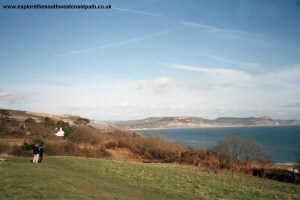 The path comes out of the landslip just to the west of Lyme Regis, crossing the border of Devon and Dorset. There are good views round the coast to the east from here. The path comes out on the Cobb in Lyme Regis. 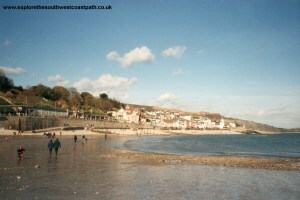 Lyme Regis is a popular resort, with good facilities. 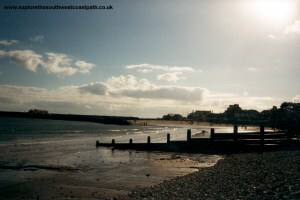 The beach here is a a mixture of sand and shingle, with sand at low tide and on the Cobb. If you are returning to Beer or Seaton by bus, they leave from the bus stop at the bottom of the main street through the town. There are buses from Lyme Regis to Beer and Seaton, but they are not very frequent. Service X53 runs from Lyme Regis to Exeter, stopping at Seaton and Beer on the way. Service 899 runs infrequently between Sidmouth, Beer, Seaton and Lyme Regis. If returning to Beer is not practical, bus service 31 runs between Weymouth, Lyme Regis and Axminster, connecting with rail services at Axminster station. Axminster is on the West of England line between Exeter and Yeovil and has trains to Exeter, Salisbury and London seven days a week. For more information on these services, see the links below. Ordnance Survey Landranger map 192 covers the path from Beer to Seaton, and map 193 the path from Seaton to Lyme Regis. Both maps are available from most book shops nationwide and are also stocked at the Lyme Regis tourist information centre. 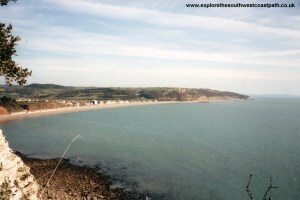 Streetmap is a web site which provides maps of the UK, including around Beer, Seaton and Lyme Regis. 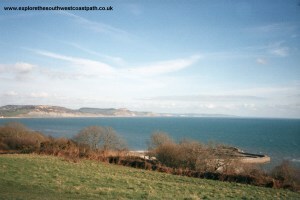 The links below will be of most use to the coast path from Beer to Lyme Regis. These maps join to provide the complete coast path between the two points.